I've almost finished my new Banana Pi cluster. The database cluster is up and running, and I've set up a cluster of four web servers. Ganglia is set up so that I can monitor the state of the clusters. I've moved banoffeepiserver.com and pyplate.com to the new cluster, and I've set up a new site called linuxwebservers.net. As its name suggests, the new site is about running web servers on Linux. It's very new at the moment, so I haven't written many articles for it yet. I've start with some posts about Apache, and I'll cover Nginx next. I'm pleased with the performance of the cluster. Most pages are cached as static HTML files, which makes a huge difference to performance. Page load times seem reasonably consistent, and there isn't that much load on the CPUs in the server nodes. The cluster isn't serving many pages at the moment, so it will be interesting to see how performance holds up when the cluster starts getting more traffic. I still have some work to do on the cluster. I had decided to use rsync to synchronize content on the server node, but I'm still toying with the idea of using Gluster instead. I have a rack of four hard disks, and I have another four Banana Pis that I can use to set up a Gluster volume. I think I should try it to see how performance is affected by using Gluster instead of storing data locally on each server. I also have to fix a problem with one of the nodes in the database cluster. 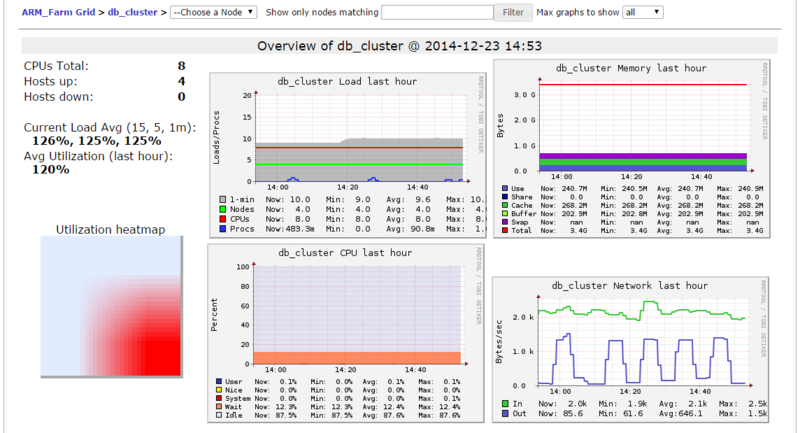 Ganglia shows that one node in the cluster is using a lot of CPU when it should be idle. Running the top command over ssh allowed me to see that some processes related to the SD card interface where using a lot of resources. I'll try checking the file system on the SD card for that node to see if it's corrupted.